The greatest fashions start with superior production services. 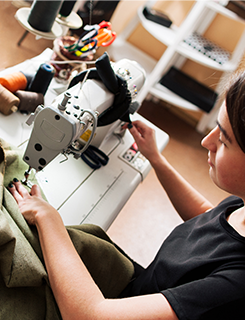 MCM Enterprise provides cut and sew services for industry-leading clients all over the world. We handle everything from. With three facilities in New York City, Hong Kong, and China, we have the ability to handle orders of all sizes with short lead-times. We know that production is often a stressful process for retailers and designers, so we work directly with your company to ensure proper delivery and extremely consistent quality. Each step of the production process is supervised by a trained team of committed employees, who all contribute to the overall quality of the product. The process is executed based on detailed specifications submitted by the client. Each job is tailored to the client’s unique requirements to ensure the best possible results. Other manufacturers purchase and produce using a variety of suppliers and contractors, which makes quality control difficult. MCM Enterprise is different. Because we are vertically integrated, we are able to ensure our high quality standards are met at every step of the way. MCM Enterprise has genuinely embraced the theory of vertical operation, and we have now expanded our domestic production operation to meet growing demand. We operate most of our production at a single facility. Quality is crucial in fashion, and all the garments produced at our facility meet the highest standards. Certain products and services are essential to specific clients, but are not available domestically. In order to fully serve all clients without outsourcing or subcontracting, MCM Enterprise has established a facility in Hong Kong. Whether you need domestic or foreign services, we can help.